Martech is a multi-billion industry dwarfing ad tech and rivaling the overall media economy yet it is barely on Madison Avenue’s radar, WPP’s GroupM unit asserts in a new Business Intelligence report published this week. 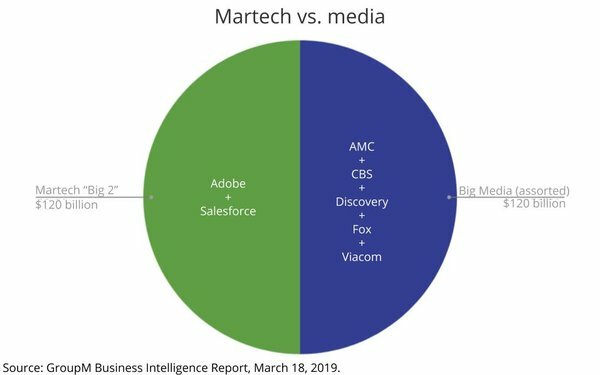 The two biggest martech -- or marketing technology platform -- players are Salesforce and Adobe, which generated $11 billion and $9 billion, respectively, last year, and GroupM Global President-Business Intelligence Brian Wieser estimates “many tens of billions of dollars” are spent on long-tail players that get less attention than the two big publicly traded, cloud-based platforms. “By market capitalization, the two companies are each worth around $120 billion, or more than the combined value of CBS, Viacom, Discovery, AMC and the new entity which houses Fox,” Wieser writes -- referring to the new Fox Corporation, which unveiled its corporate structure today, including board members like former Speaker of the House Paul Ryan and former long-term News Corp. honcho Chase Carey. “Defining the industry’s boundaries is tricky, but martech is often centered around suites of products called ‘marketing clouds’,” Wieser continued, concluding, “media-focused marketers should generally pay increasing attention to martech with every passing year.